Near Long Island City‘s East River waterfront, work has begun on an eleven-story, 199-room DREAM Hotel conceived through a joint venture between Millhouse Peck Properties, Barone Management and MATT Development. The hotel will rise from a full-block, commercially-zoned lot between 44th Road, 44th Avenue, and 9th and 10th streets, which was previously home to Manhattan Cabinetry’s factory building (the company has since relocated those operations to Woodside). Stephen B. Jacobs Group has been tapped as the architect and the studio has designed a Standard Hotel-esque tower where the room floors are pitched above various restaurants, bars and outdoor terraces. 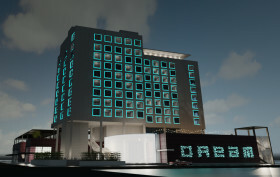 New nighttime renderings show windows framed by LED lighting. A previous image suggested the developers were looking to salvage a corner facade of the factory-building, but the facade is no longer depicted in the new set of renderings and the entire factory structure has been cleared from the site.